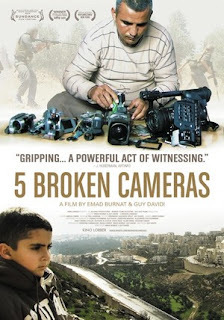 A Birdsong of Perseverance: An extraordinary work of both cinematic and political activism, 5 Broken Cameras is a deeply personal, first-hand account of non-violent resistance in Bil’in, a West Bank village threatened by encroaching Israeli settlements. Shot almost entirely by Palestinian farmer Emad Burnat, who bought his first camera in 2005 to record the birth of his youngest son, the footage was later given to Israeli co-director Guy Davidi to edit. Structured around the violent destruction of each one of Burnat’s cameras, the filmmakers’ collaboration follows one family’s evolution over five years of village turmoil. Burnat watches from behind the lens as olive trees are bulldozed, protests intensify, and lives are lost. “I feel like the camera protects me,” he says, “but it’s an illusion."